The V301E has plastic keys glued to a metal chassis. The V301E Continental Organ utlized a traditional plastic organ keyboard assembly rather than the sawn wooden keys provided on the previous V301J and V301H models models. 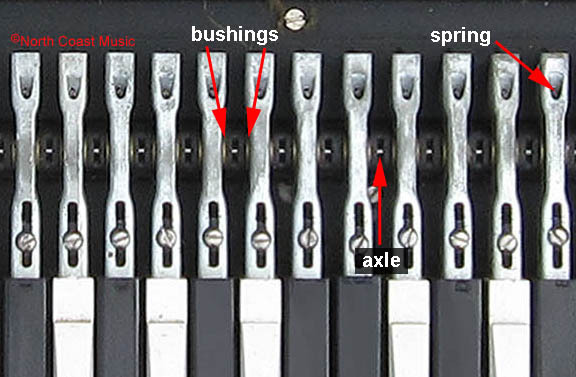 Each key had a metal chassis with a brass bushing that swiveled on an axle. Plastic key caps were glued to the top of the metal key chassis. These key caps frequently loosen and at times, even fall off the organ. I have found that rubber cement, purchased art an office supply store, is an excellent adhesive to reinstall a loose key. Use the glue sparingly to prevent the glue from dropping into the key mechanism. Although the wooden key organs are prefered by many for their collectibilty, I personally prefer the faster action that comes from the platic keys on the Italian Continental Organs. The Italian Continental offers an improved method for mounting the keybed to the body of the organ. On the original, wooden key models, a series of wood screws held the keybed in the organ. When all the screws were removed, the keybed was completely loose in the organ cabinet. The Italian versions of the Continental put a hinged pivot point at the rear of the keybed. 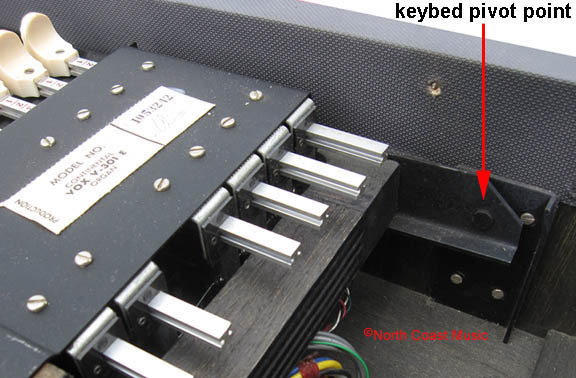 When three keybed screws are removed from the bottom of the organ, the keybed swivels up 90 degrees for service.